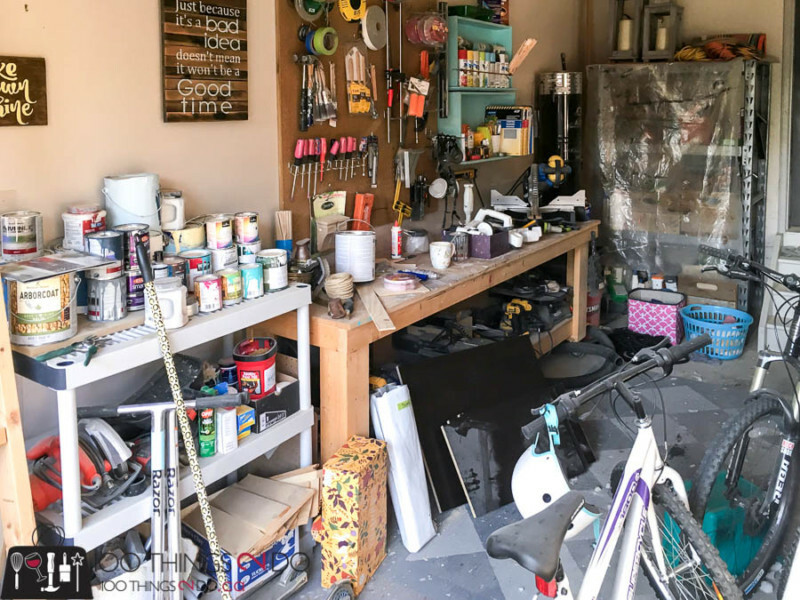 I’m alotted half of the garage for my workshop, and in that space I need to house my power tools, a workbench, my Jeep hardtop and any furniture/projects I’m in the midst of. In the summer, bikes also get stored on my side – so it’s tight, it’s chaotic and it’s inefficient. All of the paint has to come in the house as temperatures drop so that they don’t freeze over the winter, and everything (absolutely EVERYTHING) gets covered in sawdust every time I build or refinish. I tried tarping my one storage shelf, but the sawdust still found its way in. Do you see the paintbrush in that pile? Neither did I. The sawdust was almost 3″ deep underneath my shelving unit. 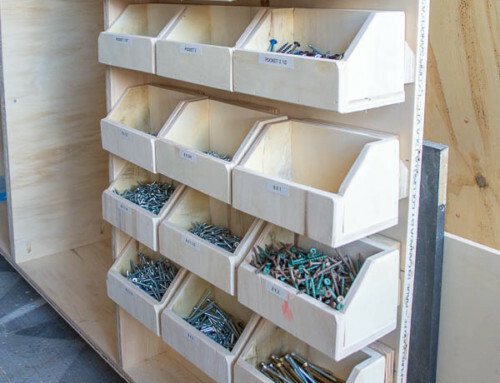 SO – I decided that I wanted some cabinetry in my garage workshop / She-shop to organize my supplies and keep everything sawdust free. Like every good organizing post will tell you, first you have to remove EVERYTHING from the space. My driveway looked like a garage sale, but it allowed me to pressure wash the garage floor and walls and start my She-shop out on a clean slate. I found some used kitchen cabinets on Kijiji for $80 and (fortunately) they were a perfect fit! I did build small bases for the lower cabinet and pantry cabinet to keep them off of the floor, but other than that, they were just set into place. I have to brag a little here – I hung the two upper cabinets ALL BY MYSELF! Don’t do that yourself – I did almost fall off the ladder and whatever muscle connects your shoulder to just below your ear was awfully sore the next day, but I was feeling a little “Sheera” after hauling them and hanging them without any help. with my paint sprayers on the top shelf of the pantry, spray paints one shelf down and the rest of my paint supplies on the bottom shelves. 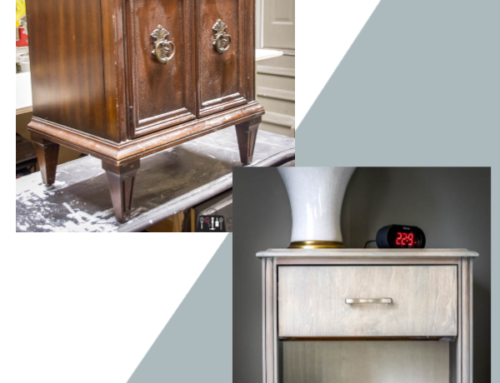 I made this faux-granite counter top ages ago and it was almost a perfect fit to top the new (to me) lower cabinet – which holds my gallon-sized cans of paint and my toolbox. By moving all of my paints to the wall that is part of the house (and I have an insulated garage), I shouldn’t have to move all of my paints inside for the winter. The back wall should keep anything near it from freezing. SCORE! My workbench area got some paring down too – lesser-used tools were re-homed to the upper cabinets, as well as cloths, sandpaper and separated bins for hooks, handles and knobs. The lower shelf of my workbench now houses only those tools that I use the most often and/or those that were too big to fit into the new cabinetry. 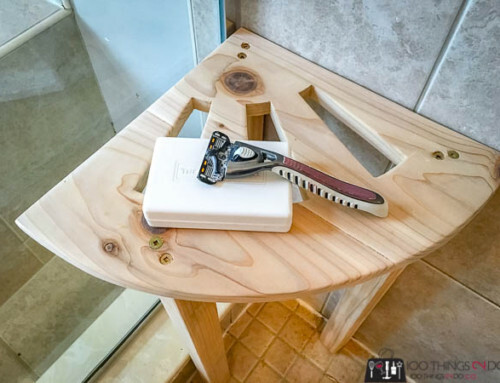 If you are a DIYer and have a She-shop / garage workshop, then you absolutely need an organizer like the Husky one below. Having screws, nails, washers etc all organized and separated is SUCH a time saver and definitely makes life easier. This is one of the best things in my entire workshop. when you buy the pegs for the pegboard, they should come with these little pieces of plastic. USE THEM! They keep your pegs from popping out every time you grab a tool. 2. get a small metal bucket from the dollar store, flatten one side of it and drill a hole in it. This is a great place to keep pencils, exacto knives, and even a tape measure so they are within easy reach. (I spray-painted mine black to match the rest of my She-shop “decor”. 3. Drill a hole in the back of your drill bit and drill cases so that they can be hung on the pegboard as well. 4. I hung a power bar on the pegboard near the centre of my workbench. This allows me to work on either end of the bench without additional extension cords. 5. 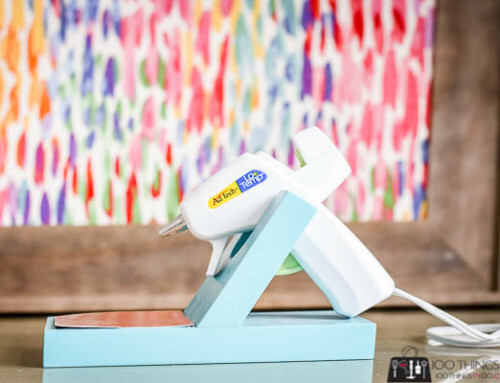 This is going to sound weird, but if you have a Hubby that doesn’t put anything away, and/or if you loan out any of your tools – spray paint them. This will help you keep track of which are yours when it comes to reclaim your stuff. Mine were previously pink, in the hopes that Hubby would be too embarrassed to use them… didn’t work. I decided to give them a coat of black spray paint this time to freshen them up and make my new She-shop look pretty (for a little while anyways). This is my new playroom! What do you think?! It’s organized, it’s pretty, it’s efficient and it’s all MINE! Everything else I already had – L-brackets to hold the uppers in place, black spray paint, dollar-store buckets etc. 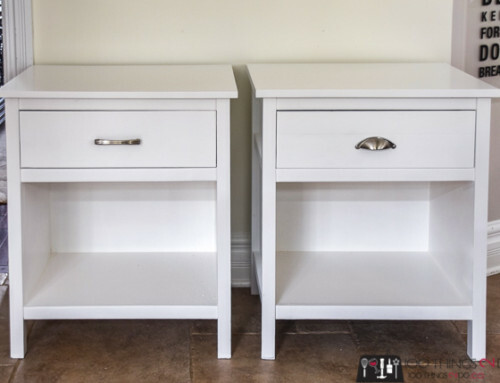 Clean, organized and pretty – now it’s time to get building!